The problem with invasive plants is that they propagate too easily. 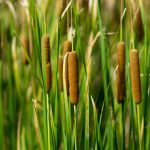 That enables them to spread quickly from backyard cultivation to the neighbors’ yards and even into the wild. It’s generally a good idea to avoid planting them. What are the invasive plants in zone 7? 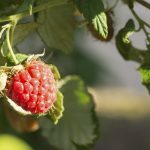 Read on for information about zone 7 plants to avoid cultivating in your garden, as well as tips on invasive plant alternatives. The U.S. Department of Agriculture developed a zone system dividing the nation into zones 1 through 13 based on the lowest annual temperatures. Nurseries mark the plants they sell with their appropriate zone range. This enables gardeners to readily identify plants hardy for their regions. Most areas of the country have some invasive plants that grow well there. This includes zone 7, those areas of the country where the low annual temperatures range from 0 to 10 degrees Fahrenheit. You may be surprised to learn that invasive plants in zone 7 include a number of trees. But some trees simply spread so fast you can hardly keep up with removing them. One such tree has a delightful-sounding name: tree-of-heaven. It’s also called ailanthus, Chinese sumac and stinking sumac. The tree propagates quickly from seeds, leaves and suckers and is very difficult to control. Invasive plant alternatives for the tree-of-heaven include native sumacs, like staghorn sumac. 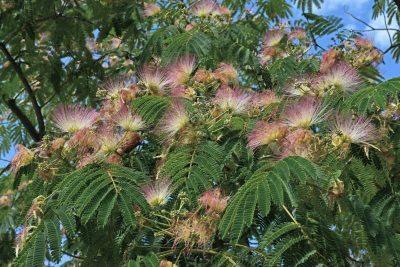 Albizia julibrissin, also called silk tree, mimosa, and silky acacia, was introduced as an ornamental and planted for its feathery pink flowers. But you may quickly regret the decision to plant it, as little trees sprout every year all over your yard, even after you chop down the original. Invasive plant alternatives are not hard to find for trees. Instead of planting invasive non-native species, substitute these with native species. For example, instead of invasive Norway maple, plant native sugar maple. Eliminate the invasive Japanese angelica tree in favor of native lookalike devil’s walking stick. Plant native red mulberry instead of invasive white mulberry. Shrubs can also be very invasive. If you live in zone 7, here are a few shrubs you are better off leaving out of your garden. Ligustrum japonicum, also called Japanese glossy privet, produces drupes that wildlife appreciate. However, thanks to these hungry critters, the plant will quickly spread into woodlands. It crowds out native understory plants and can even disrupt hardwood regeneration. Many types of honeysuckle, including amur honeysuckle (Lonicera maackii) and morrow’s honeysuckle (Lonicera morrowii) take over all available space and develop dense thickets. This shades out other species. What should you plant instead? Invasive plant alternatives include native honeysuckles and bushes like bottlebrush buckeye, ninebarkor black chokecherry. For a more extensive list of invasive plants in zone 7 and what to plant alternatively, contact your local extension service.